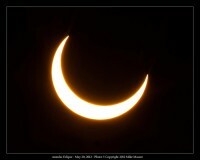 Annular solar eclipse from Bear Valley, CA. Off from the center by 600 - 700 miles so it shows up as a nice crescent. Venus transiting the sun on June 5, 2012. Double hydrogen alpha filter.